In computing, plain text is the contents of an ordinary sequential file readable as textual material without much processing. 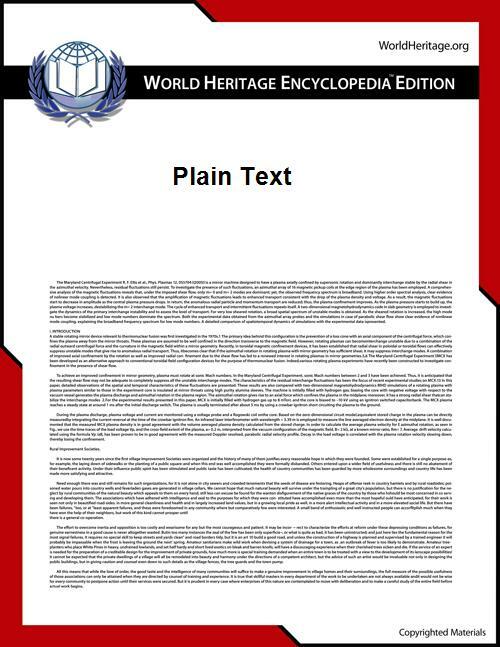 Plain text is different from formatted text, where style information is included, and "binary files" in which some portions must be interpreted as binary objects (encoded integers, real numbers, images, etc.). Files that contain markup or other meta-data are generally considered plain-text, as long as the entirety remains in directly human-readable form (as in HTML, XML, and so on (as Coombs, Renear, and DeRose argue, punctuation is itself markup)). The use of plain text rather than bit-streams to express markup, enables files to survive much better "in the wild", in part by making them largely immune to computer architecture incompatibilities. For instance, Rich text such as SGML, RTF, HTML, XML, and TEX relies on plain text. Wiki technology is another such example. «Plain text is public, standardized, and universally readable.». «The distinction between plain text and other forms of data in the same data stream is the function of a higher-level protocol and is not specified by the Unicode Standard itself.». More formally, the fundamental distinction of "plain text" is that no information would be lost if you went through and translated the file to a completely different character encoding, or translated it to no encoding by just printing it out generically (provided the printer has a good enough font that you can correctly distinguish all the characters!). No information is conveyed by the fact that an "A" in the printout was originally stored as a byte with value 65 (as it would be in ASCII), or with value 193 (as in EBCDIC); and it certainly wasn't meant to express half of the bits of an integer. The purpose of using plain text today is primarily independence from programs that require their very own special encoding or formatting, and from computer architecture issues such as byte order, etc. 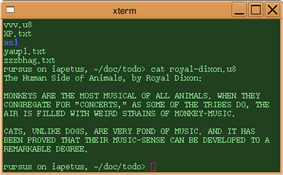 Plain text files can be opened, read, and edited with countless generic text editors and utilities. Examples include Notepad (Windows), edit (DOS), ed, emacs, vi, vim, Gedit or nano (Unix, Linux), SimpleText (Mac OS), or TextEdit (Mac OS X). Many other computer programs are also capable of processing or creating plain text, such as countless commands in DOS, Windows, Mac OS, and Unix and its kin; as well as web browsers (a few browsers such as Lynx and the Line Mode Browser produce only plain text for display). Plain text files are almost universal in programming; a source code file containing instructions in a programming language is almost always a plain text file. Plain text is also commonly used for configuration files, which are read for saved settings at the startup of a program, and for much e-mail. These additional characters were encoded differently in different countries, making texts impossible to decode without figuring out the originator's rules. For instance, a browser might display ¬A rather than ` if it tried to interpret one character set as another. The International Organisation for Standardisation (ISO) eventually developed several code pages under ISO 8859, to accommodate various languages. The first of these (ISO 8859-1) is also known as "Latin-1", and covers the needs of most (not all) European languages that use Latin-based characters (there was not quite enough room to cover them all). ISO 2022 then provided conventions for "switching" between different character sets in mid-file. Many other organisations developed variations on these, and for many years Windows and Macintosh computers used incompatible variations. The ASCII codes before SPACE (= 32 = 20H) are not intended as displayable characters, but instead as control characters. They are used for diverse interpreted meanings. For example, the code NULL (= 0, sometimes denoted Ctrl-@) is used as string end markers in the programming language C and successors. Most troublesome of these are the codes LF (= LINE FEED = 10 = 0AH) and CR (= CARRIAGE RETURN = 13 = 0DH). Windows and OS/2 require the sequence CR,LF to represent a newline, while Unix and relatives use just the LF, and Classic Mac OS (but not Mac OS X) uses just the code CR. This was once a slight problem when transferring files between Windows and Unix systems, but today most computer programs treat this seamlessly. In 8-bit character sets such as Latin-1 and the other ISO 8859 sets, the first 32 characters of the "upper half" (128 to 159) are also control codes, known as the "C1 set" as opposed to the "C0" set just described. However, the commonplace Windows character set called code page 1252 assigns printing characters to these code points (other than this, cp1252 is the same as Latin-1). It is not uncommon that Web servers identify a document as being in Latin-1, when in fact it is in code page 1252, and uses characters in the C1 set as graphics. This may or may not lead to unexpected results. ^ Coombs, James H.; Renear, Allen H.; DeRose, Steven J. (November 1987). "Markup systems and the future of scholarly text processing".